KENNEDY SPACE CENTER, Fla. — KoreaSat 5A was lofted into orbit at 3:34 p.m. EDT (19:34 GMT) Oct. 30, 2017, aboard a Falcon 9 rocket under clear skies from Launch Complex 39A (LC-39A). This marked the third SpaceX launch this month (October) alone, continuing an ambitious 2017 launch schedule for the Hawthorne, California-based company. The countdown timeline kicked off at about 1 hour, 13 minutes before the opening of the launch window with SpaceX’s launch director providing the go-ahead for the rocket’s propellant to be loaded onto the launch vehicle. Three minutes later, RP-1 – a highly refined version of kerosene – was loaded onto the Falcon 9 in preparation for the day’s flight. Thirty-five minutes before the countdown clock reached zero, liquid oxygen (LOX) loading began. The Falcon 9’s nine first-stage Merlin 1D engines began their chilldown before flight a mere seven minutes before the mission was slated to get underway. With only a minute left on the clock, two important milestones were carried out: the Falcon 9’s flight computer commanded the rocket to begin final pre-launch checks and the two-stage rocket’s propellant tank pressurization began the ramp up to flight pressure. This cleared the way for SpaceX‘s launch director to confirm that the rocket was cleared for flight just 15 seconds later. Three seconds before liftoff, the Falcon 9’s engine controller ordered the engine ignition sequence to start with the rocket leaving the pad shortly thereafter. At 1 minute, 16 seconds minutes after engine ignition, the Falcon 9 went through the part of its flight that is called maximum dynamic pressure, more commonly known as “Max Q”. During this period, the launch vehicle experienced the greatest aerodynamic stress during its flight. At 2 minutes, 33 seconds into the flight, the nine first stage Merlin 1D engines shut off with stage separation occurring about three seconds later. The second stage ignited several seconds later to push KoreaSat 5A into a parking orbit some 8.5 minutes after launch. After an 18-minute coast phase, the second stage re-ignited for a one-minute burn some 26 minutes, 45 seconds after leaving Florida. This placed KoreaSat 5A into an elliptical geostationary transfer orbit. Coming just four days after SpaceX performed a static fire test of the Falcon 9, the October 30 launch featured a brand new first stage which successfully touched down in the Atlantic Ocean onto the autonomous spaceport drone ship named Of Course I Still Love You. 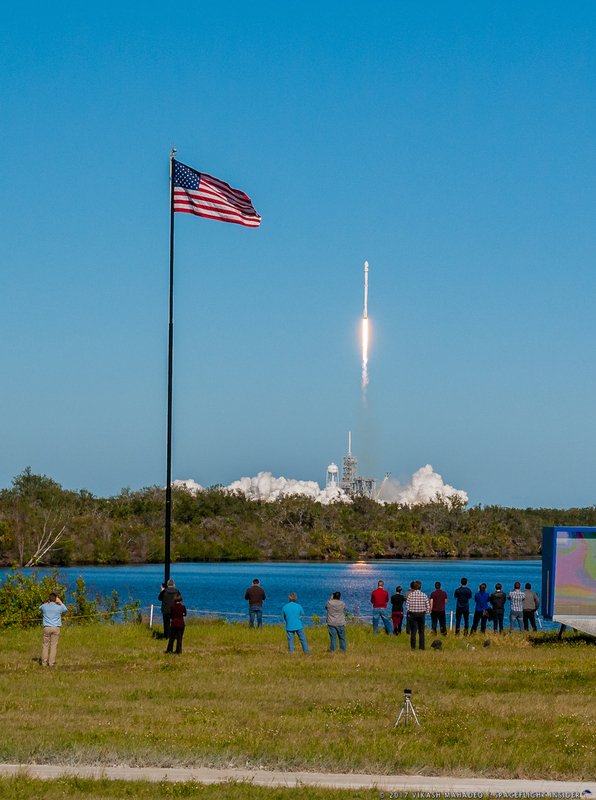 This was the 19th successful landing – by land or sea – of a Falcon 9 first stage, a feat first performed successfully by SpaceX in December 2015. KoreaSat 5A is operated by the South Korea-based KT Corporation and will provide direct-to-home broadcasting, in addition to other communications services, to Korea, Japan, the Philippines, Guam, Indochina, and South Asia. In addition to upgrading communication services to Southeast Asia and the western Pacific, it will replace the aging KoreaSat 5 satellite that was launched in 2006. KoreaSat 5A will occupy the 113 degrees east orbital slot once it reaches its final geostationary orbit at 22,300 miles (35,900 kilometers) above the Earth. Representing the 16th SpaceX launch of 2017, the company is gearing up for up to four more Falcon 9 launches to round out the year for a possible total of 20 flights. The next SpaceX flight on the company’s manifest is currently scheduled for November 16 from LC-39A. It is also slated to fly from NASA’s Kennedy Space Center per FCC licenses obtained by SpaceX. The purpose of the payload remains unknown. It is codenamed “Zuma” and was built by Northrup Grumman. Little else is known about the mission. Before the year is out, SpaceX also has another cargo resupply run to the International Space Station under the $1.6 billion Commercial Resupply Services contract the NewSpace firm has inked with NASA and, possibly, the maiden flight of SpaceX’s Falcon Heavy rocket.